The Crazy Quilt Journal Project comes to a close for 2014! What a year it was! I had such a wonderful time stretching and learning with each new pincushion! For the majority of the year, the blocks were 9" diameter and used old CDs to help form the base. For the December pincushions, the blocks were 6 1/2" to 7"diameter and I used wide mouth canning jar lids for the bases. Many of the blocks were from old blocks that I had pieced or been given but had lost interest in. Some were pieced new and for every one, I tried to stretch my skills and try something new. In January, I did my first ever stump work butterfly on felt. In February, the block had a silkie, which I usually am not terribly fond of, but I used it to set the theme. In March I contented the stump work theme, but made the leaves truly three dimensional and standing up off the pincushion. In April, I played with a three dimensional ribbon rose of a variety I had not done before along with some ribbon leaves. 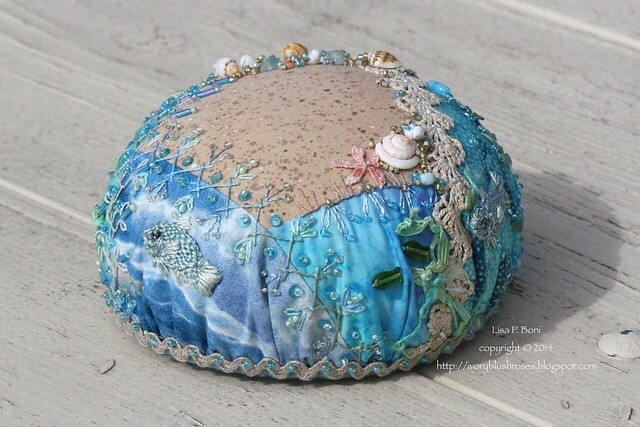 In May, I was inspired by a box of ribbon and trims from Helen Gibb and made the pincushion using nearly all the elements including the large piece of embroidered ribbon. In June, I tried my hand at making morning glories out some wide silk ribbon. In July, I made the pincushion into my daughter's ring pillow for her wedding and added a lace and ribbon ruffle around the base. In August, I made a large needle woven sunflower. September's pincushion has true to life flowers copied from my garden. October was the most fun to create, with it's 3D elements of the little knitted cat and silk pumpkins and stump work leaves and corn stalks! November's pincushion was actually my "white elephant" gift to Connie K at the CQI retreat in September. I has lots of shells and embroidered fish. 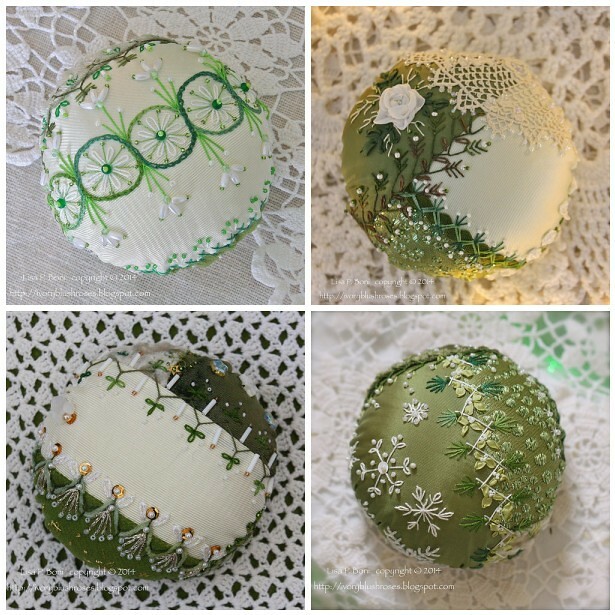 For December, I made four smaller pincushions, only 3 1/2" diameter instead of the usual 5 1/2 to 6" diameter. Once again, these were all made from old blocks that I had from long ago and repurposed into pincushions! I loved the three diminutional quality of the pincushions and how the blocks transformed once pulled into shape. Some of the flat stitched blocks didn't seem like much to look at, but once they were shaped, they really sprang to life! Now it's time to think about CQJP 2015! It's going to be something completely different and I'll post more once I figure out exactly what I'm doing! I'm planning on a color palette that I usually avoid (but is growing on me!) and hope to create a larger quilt with the blocks with "uber" stitching as the focus.! There is only one thing to say -- a whole year of BEAUTIFUL !!!!! Congratulations on simply lovely work. Your CQJP for this year was so much fun for us, your readers. 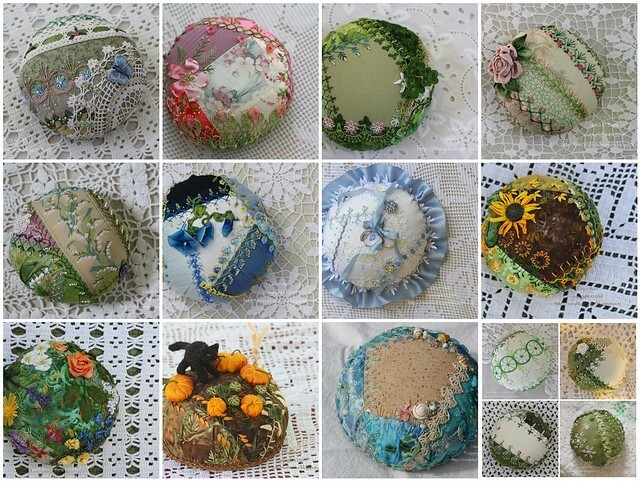 Each and every pincushion is a work of art. I look forward to seeing what you do in 2015. As for me, I am going to finish up CQJP 2012 and 2013 this year and start fresh in 2016. Needs must. Your pincushions are all so beautiful! Every month I looked forward to seeing each one and waiting for the next one - like waiting for each week's episode of a favourite TV series. It has been truly inspirational following you on these! I have so much enjoyed seeing all your different pincushions throughout the year - each one was fun to see. Can't wait now to see what 2015 will bring!